Since 2017, our sister practice, West Dermatology Skin Cancer Center has offered unparalleled medical and surgical dermatology services right next door. Plus, they accept most medical insurance! When it comes to treating your body’s largest organ, the skin, you should entrust your care to only certified dermatologists. Not only that, but it’s recommended to have an annual skin check to help prevent skin cancer. Thankfully, West Dermatology’s team is backed by a wealth of education and experience. With over 45 years of combined experience, these medical experts’ main focus is being your family’s trusted skincare provider. The practice is built around a shared commitment to the life of your skin. Led by Drs. Stacy Tompkins, Brook Brouha, Shane Hamman & Monica Boen along with dermatology physician assistant Evan Beale, PA-C, West Dermatology La Jolla/UTC offers empathetic and expert services to every patient. Additionally, they are also in contact with several local organizations and carriers. 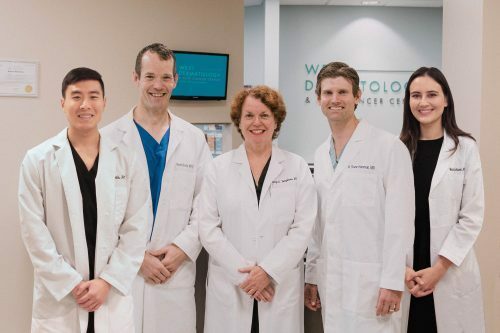 With a patient-forward approach, West Dermatology’s staff of seasoned healthcare professionals focus on safely producing the best outcomes for managing chronic skin conditions, with an emphasis on progressive and innovative procedures, including Mohs Micrographic surgery. This ensures that patients are receiving the most advanced surgical and skin care treatments available. West Dermatology is proud to be a part of your skincare journey. Contact them today at (858) 263-0571 or online to schedule your annual skin check and initial consultation.